I love vintage recipes and although my Mother does not know how old this is for sure, she guesses that it was from the 1950’s or earlier, this was my Grandmothers recipe, she said her quest was to find the perfect double crust lemon pie, she tried many different recipes and then found this one in the newspaper, (Mom still has the original it’s so faded you cannot see the date). It’s tart and sweet and lemony. Oddly, my Mom never made it for our family and until today I had never tasted this delicious pie. I am so glad she decided to share it, I love lemon pie, this is different and very nice. The actual name of the recipe is “Super Good Two Crust Lemon Pie”. Serve with a dollop of sweetened whipped cream or creme fraiche whipped cream. Double pie crust (homemade or pre-made) see my recipe below. Whisk sugar and flour in small mixing bowl and set aside. In another bowl beat eggs until they are thick and creamy and light in color, add the sugar flour mixture and stir until smooth, add the butter, lemon juice and water and mix well to combine. Line pie pan with bottom crust, pour lemon filling in and roll out the top crust, lay on top crimp or flute the edges to seal, make a few vents I just cut a few x’s . 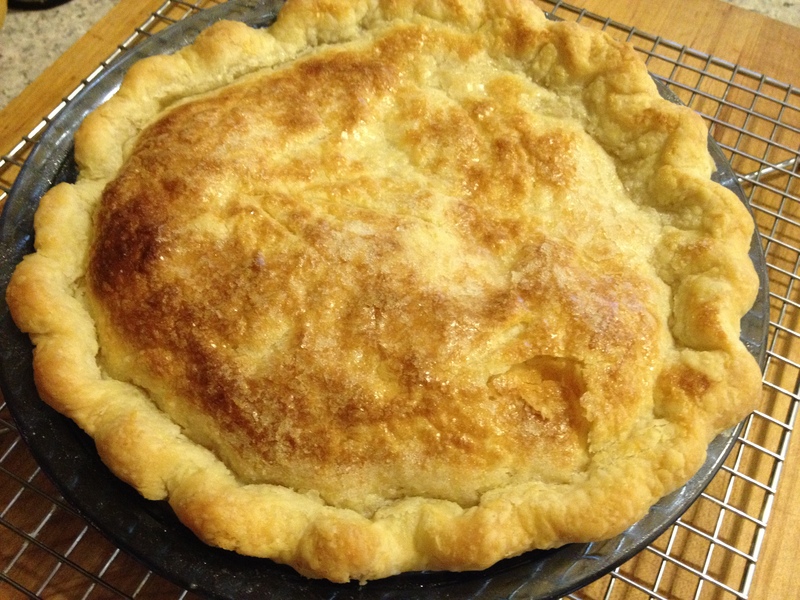 Refrigerate the pie for 15-30 minutes so that the pie crust is chilled before putting in the oven. I like to brush the top of the pie with egg wash or cream and sprinkle with sugar, this is optional of course. Bake for 35 minutes, the crust will be golden brown. Let cool completely before serving. 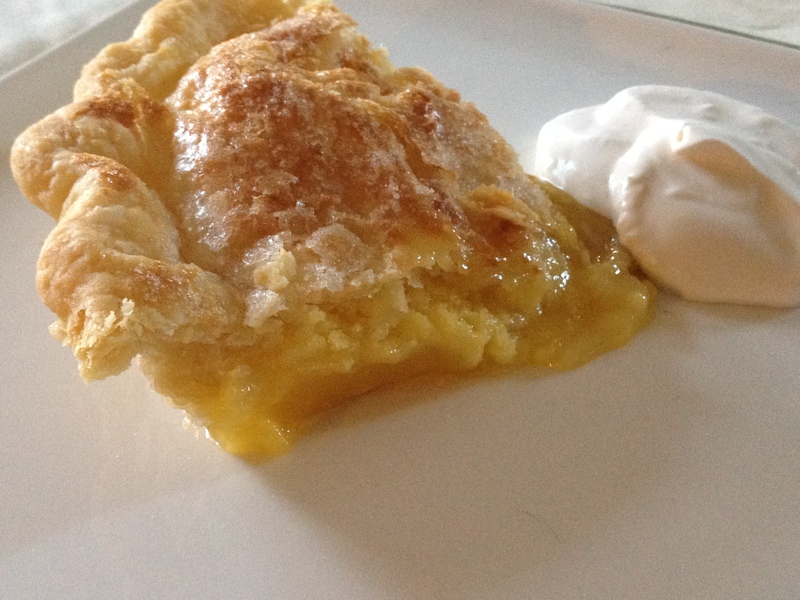 I made whipped cream with heavy cream, creme fraiche and a little brown sugar to go with the pie. I love Lemon anything, especially pie! I look forward to trying this out soon. Happy Easter! Me too, I’m a huge citrus fan. Thank you so much and a very Happy Easter to you too! Thank you it really is yummy! This sounds so good!! I am a HUGE fan of citrus!! So this pie is right up my alley for sure. Yummy! Thank you so much, I’m a big citrus fan too! Tart, sweet and lemony? Sounds divine. I’m happy you discovered this pie so you could share it with us! Thanks Hannah, it really is delicious. I love talking to my Mom, I never hang up without having written down a great recipe.